Yes, it is Wednesday again! I am always anxious for Wednesday to roll around so that we can showcase our DT cards at SSW! So yes, go take a peek! This week Tiddlyinks is our sponsor. They have some really sweet and unique images. Please take a few moments to look around on their site. Tiddlyinks is offering a $10 gift certificate to the lucky weekly winner at SSW! So why don't you play along. 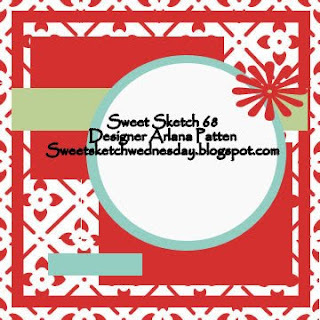 Be sure to use this sweet sketch from Arlana for this week's card! Papers are from Heidi Grace! This is a rub on also from Heidi Grace. It was perfect for my card! Thanks, Heidi. I had the opportunity of meeting Heidi last year. Didn't know she lived in my area. So when I found out she had a little shop, I stopped by and purchased some fun items. Twice I have bumped into her at JoAnn's. She has since closed her little store due to the arrival of her third baby! Not sure if her little one has arrived yet but I do wish her well. What a sweet and talented lady and Mom! Wonderful!! This is a great Halloween card. 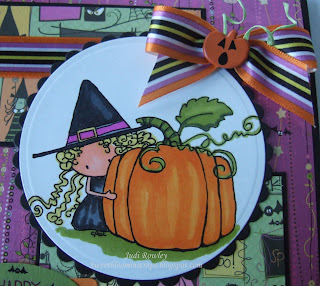 I just love that ribbon with the little jack-o-lantern in the center. This looks fantastic! Have a really great day Judi, I'm sorry I didn't get around here last week. Hi Grandma, what a wonderful card I just love the image and the colours are awesome. Pumpkin my favourite. Hope the holiday is going well and you're having heaps of cuddles with your new Granddaughter. Judi, what an adorable card!!! Such yummy papers and that ribbon, delish!!!! Fun to have met a local celebrity! Have a wonderful time with the family. Just adorable!!! Love it! Such an adorable image and I LOVE all your Halloween details! Cutie, cute, cute!!!! Your card is just darling Judi! It is such an adorable image. I love all your little extras on your card too! I hope you are having a great time with R and that new little one. I slept 12 hours last night. I think I am getting caught up from my trip! Oh it's perfect. Love that sentiment with the bats. The ribbon is so perfect, we don't have ribbon like that over here at all, plain and boring. Hope everyone is all well and you're having fun. What a fab card! Cute image, and I love that brad! Oh what fab card Judi!! 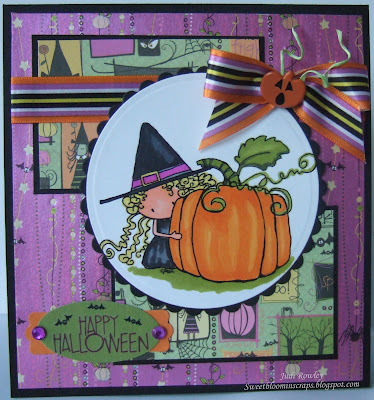 With those beautiful papers and gorgeous ribbon, your image couldn't look any sweeter.. Love how colorful your colouring turned out and the rub ons and pumpkin button are perfect additions to your beautiful card. Have a great week! 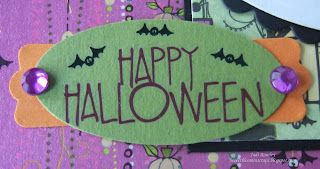 Perfect little Halloween card and the papers are just great with this image. Love it! Judi this is so cute. I love the coordinated DP and your coloring of this adorable image is perfect! So very cute and love the fabulous colours!!! Thanks for the lovely comment!! This is just too stinking (I mean that it a nice way) cute!!! Love everything about this card - from the coloring to the DP used.